Monforte de Lemos is located in a beautiful valley in the region of Galicia, northwest Spain. It began as a fortified hill village on Mount St Vincent which today dominates the town. Although the village was destroyed when the Arabs invaded during the 8th century, it later re-emerged after the Benedictines were encouraged to settle in the area to spread Christianity. This fortress city was centred round the Monastery and Castle with large sections of the original wall, three gates, and three towers remaining. One of these towers is the Torre del Homenaje where you can get marvellous views of the town. Within the Castle is the 13th century Torre da Homenaxe. It was named the Homage Tower because this was where the peasants swore allegiance to the feudal lord following their unsuccessful rebellions. From the Torre del Homenaje you can stroll through the Jewish quarter on your way to the centre of town. The Jews that settled in this territory became heavily involved in the silk and precious metal trade, and the Jewish quarter in Monteforte was one of the largest in Galicia until they were eventually driven out in 1492. Unlike most other Spanish towns, the Jews were free to live anywhere they wished. However, they chose to stick together and built their own synagogue and bath house. Many of the streets were named after the type of business they operated such as the Rua Zapateria (Shoemaker Street) and the Rua de los Herreros (Blacksmith Street). The old prison can be found on Pescaderias Street and from the roof top, which has been converted into a terrace, you can get great views of the old quarter. Monforte de Lemos is the second largest town in the province with lovely parks and a wide variety of shops, restaurants, and bars, many of which have outdoor terraces. There are also great places to go for a walk or a bike ride, particularly along the Cabe River which runs right through the town. One of the best times to visit Monforte is in August when the Empanada and Lamprey festival takes place. Otherwise September they hold an entertaining festival in the historic quarter to celebrate World Jewish Day. The old 16th century hospital houses the Ribeira Sacra Wine Centre which is one of the main attractions in Monforte. It has an excellent tapas bar and wine shop selling over 100 different wines produced in Galicia. The Sargadelos Gallery is Galicia’s most famous pottery and all their pieces are finished off and decorated by hand. However for those who enjoy art galleries Monforte has some excellent art galleries and museums. At one end of the old Roman bridge is the Museum of Sacred Art where Count Lemos’ art collection is exhibited. He had donated his collection to the town, and today it is considered to be one of the most important in Spain. The Nosa Senora Da Antiga College was started in 1593 by Cardinal Rodrigo de Castro and could only be completed after the sale of a painting which is now stands in a museum in Berlin. However there are many special paintings housed in the College including some by El Greco. The Escolapios Art Gallery, although small, is also worth a visit as it has two pieces by El Greco as well. The San Vicente Del Pino Monastery originally dates back to the 10th century and was considered to be one of the first built in Galicia after the Arabs left. The building you see today though was built during the 16th century in the Neoclassic style, and the church inside is a Renaissance design with a gothic interior. 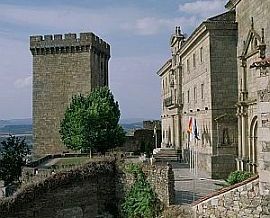 Parts of the Monastery and the Count’s palace now form part of the Parador de Monforte de Lemos (Hotel Hostal Monasterio San Vicente do Pino). This four star hotel offers superb accommodation, overlooks the town, has a gymnasium, Jacuzzi, and seasonal swimming pool, as well as a gastrobar serving local and international cuisine.